The festival begins with a bang as June 28 is one of those days that you want to be in about 5 places at once. All the venues of the festival, 8 outdoor stages for free shows and 14 concert halls and clubs, are all within easy walking distance. It’s possible to hear a number of great shows in one day but get your track shoes ready for day one as some of the available performances include Charles Lloyd and his Quartet in the first of three “Invitation Series” shows that Mr. Lloyd will be part of, at the beautiful Theatre jean-Duceppe, followed by Wynton Marsalis and his Jazz at Lincoln Center Orchestra who should feel right at home playing the beautiful, new Montreal Symphony Hall, the Maison Symphonique de Montreal. Andre and Alain mentioned to me that they noticed Wynton early on in a performance in New Orleans and booked him for the festival long before he became the household name he is today. That’s the kind of forward thinking that makes Montreal a festival that’s often ahead of the game and unique in its vision as well as stylistic scope. More on that variety in style later. Speaking of later on day one of the 34th FIJM, one might want to take the short trip from the Maison Symphonique de Montreal after Wynton’s show to hear a true international jazz legend, the reigning king of Cuban jazz, Chucho Valdes and his latest band, The Afro-Cuban Messengers playing the grand hall, the Theatre Maisonneuve. Then again you could choose to hear one of Canada’s local jazz heroes, the great vocalist Holly Cole, performing on the second of three nights in the intimate Theatre du Nouveau Monde. After that it’s a matter of decisions, decisions, decisions! Will you make your way to the new club L’Astral in the ground floor of the festival headquarters, The Maison de Festival, to hear rising saxophone star Tia Fuller, to the Theatre jean-Duceppe to hear established saxophone star Ravi Coltrane and then finish off the night at one of my favorite venues, the converted church called Gesu, to hear guitarists Martin Taylor and Peppino D’Agostino? There’s more on the schedule for day one than what I’ve mentioned here and I haven’t even taken into account all the free music on the outdoor stages that begins at midday and goes to late in the evening. I hope you haven’t worn yourself out already because there are 9 more days to go! Without giving you a daily laundry list of all the shows I’ll simply mention some of the features of the lineup that stand out to me that prove that the Montreal Jazz Festival truly exhibits tremendous variety with literally something for everyone. If you want vocalists you can take your pick from many including Canada’s own Nikki Yanofsky, taking her place next to the likes of George Benson, performing his salute to Nat King Cole. Then there’s Leon Russell, Lyle Lovett, and Box Scaggs from the pop world, Madeleine Peyroux, sure to play some of her new Blue Rooms release, rising star Gregory Porter and the soulful Macy Gray joining David Murray and his Infinity Quartet. One thing that’s stood out to me in the decade I’ve been attending the Montreal Jazz Festival is the international flavor in the schedule and I’ve always discovered someone I’ve not seen even in my home base of New York City and been surprised by something new I’ve never heard before. This year’s festival features, among other international stars, Africa’s Lionel Loueke, Alpha Blondy, Soweto Gospel Choir and Vieux Farka Toure, Frenchman Nicolas Repac blending electric jazz and dance rhythms, Cuba’s terrific young pianist Harold Lopez-Nussa, and a special connection to England with Courtney Pine performing his latest project House of Legends, along with his fellow countrymen Soweto Kinch, Phronesis, The Herbaliser and Gwilym Simcock. Montreal has a special connection to New Orleans for some obvious reasons and it’s reflected in the festival each year as well. Each day begins with an outrageous street parade, NOLA-style, and artists from The Big Easy filling the festival lineup with that distinctive New Orleans beat and style. This year, in addition to the afore-mentioned Wynton Marsalis, you can hear Trombone Shorty & Orleans Avenue, The Preservation Hall Jazz Band, sure to perform music from their new release That’s It, which features their first original material in the decades of their legendary career, and even Mr. Mac Rebennack himself, Dr. John and The Night Trippers! Finally, the major stars of jazz are always sure to play Montreal and this year is no exception. 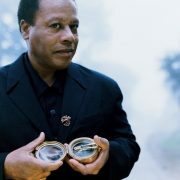 The star of stars this year is Wayne Shorter and the triumphant celebration of his 80th birthday. On June 29th, the second day of the festival, Wayne leads his own brilliant quartet at the Theatre Maisonneuve. Joining him on the stage that evening to celebrate the great saxophonist, composer and bandleader will be a who’s who of jazz today including The Joe Lovano-Dave Douglas Quintet and the new ACS Trio featuring Geri Allen, Terri Lyne Carrington and Esperanza Spalding. That event alone would make the trip to Montreal worth it! No festival celebrates birthdays better than Montreal and I’ve seen recent celebratory shows featuring Stanley Clarke and Ahmad Jamal in the past couple of years. This night should be extra special. Other star attractions include pianist Vijay Iyer in another three-day “Invitation Series” set of shows at the Gesu, Joshua Redman’s new Quartet with an orchestra doing the music from his latest album Walking Shadows, Jason Moran in what’s sure to be a delight as he performs what he calls his “Fats Waller Dance Party,” and Kurt Rosenwinkel’s brilliant new quartet. The Brubeck Brothers will perform in what will surely be a very emotional tribute to their late father Dave. Then the Gesu presents a list of shows that would be a complete lineup for most festivals, as night after night festival goers can enjoy Larry Goldings great trio featuring Peter Bernstein and Bill Stewart, Jacky Terrasson, The Bad Plus, Charlie Hunter in a duo with Scott Amendola, Tim Berne doing the music of Snakeoil, Antonio Sanchez performing with his own band in a presentation of his new solo work Migration, and the legendary John Abercrombie with Joey Baron, Billy Drewes and Drew Gress. Well, there you have just a taste of what is coming with the 34th edition of The Festival International de Jazz de Montreal. And have I mentioned how beautiful the city is? Did I mention it has world-class museums and restaurants too and that a walk up to the top of Mount Royal, the peak above the city that gives Montreal its name, is a great way to start each day to get the blood flowing with a gorgeous view of the city below as a reward? Did I mention how friendly, helpful, wonderful and just beautiful everyone is? I take home a gallon of the water in hopes of having some of this rub off on me each year! Did I say that in all the years of the festival that it’s so safe and peaceful that no one ever gets into altercations or has ever been arrested? That happens outside my door every day and there aren’t even a quarter of a million people gathering there for a music festival! All in all I’d say Leonard Feather and a host of great musicians who’ve played there from Pat Metheny to Tony Bennett have it right. This is “The World’s Greatest Jazz Festival” and you’re invited to come see for yourself as the 34th festival kicks off on Friday, the 28th of June! Kurt Rosenwinkel: MVP of Day 5 at the 34th Montreal Jazz Festival!